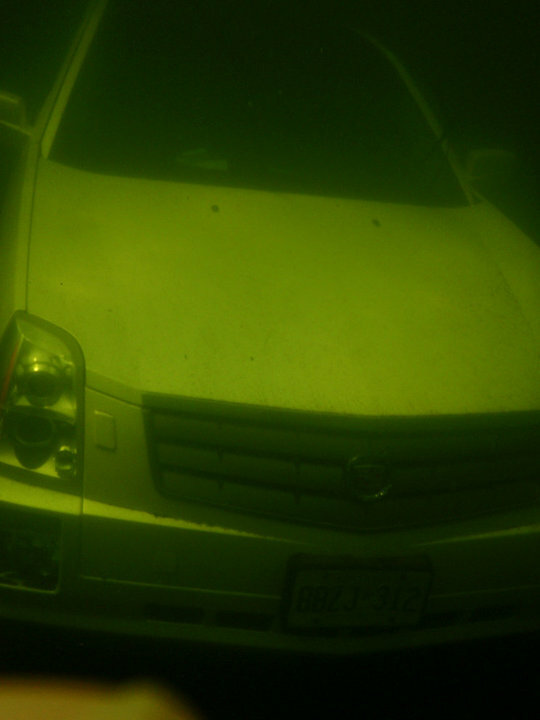 Does OnStar work underwater? I don't know if you have to be a idiot to drive drive an Escalade but it sure helps. Let me set the scene: a beautiful fall day in Ontario's famous Algonquin Provincial Park. Two tourists park their white Escalade at scenic Source Lake. Source is one of a few lakes in the park that have cottages (boat access only). It is also home to Camp Pathfinder, one of the oldest children's camps in North America. Following their visit to a friend's cottage, tourist moves his Escalade to the boat launch, so he can load the canoe on the vehicle. 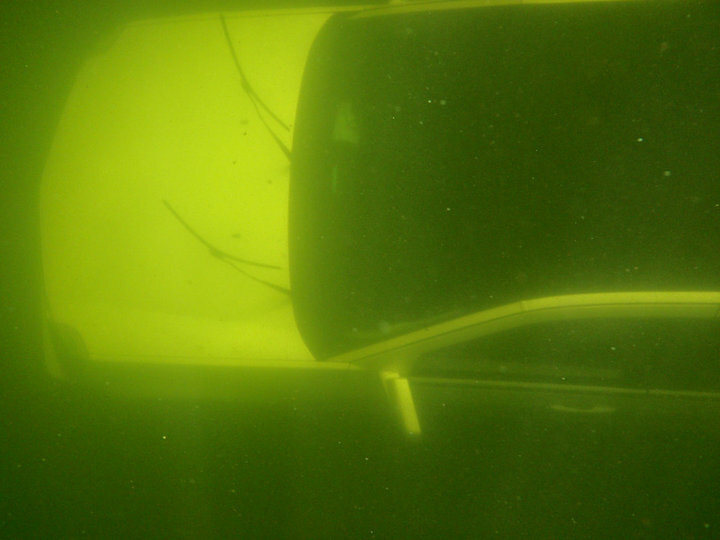 Unfortunately, he fails to put the car in PARK, and it rolls down the hill into the lake, floats about 100 feet out, then sinks to the bottom, where now, four days later, it still rests in 20 feet of water. It will be an expensive adventure. The car, the expensive tow job plus the big fines for leaking fluids in to the pristine lake. 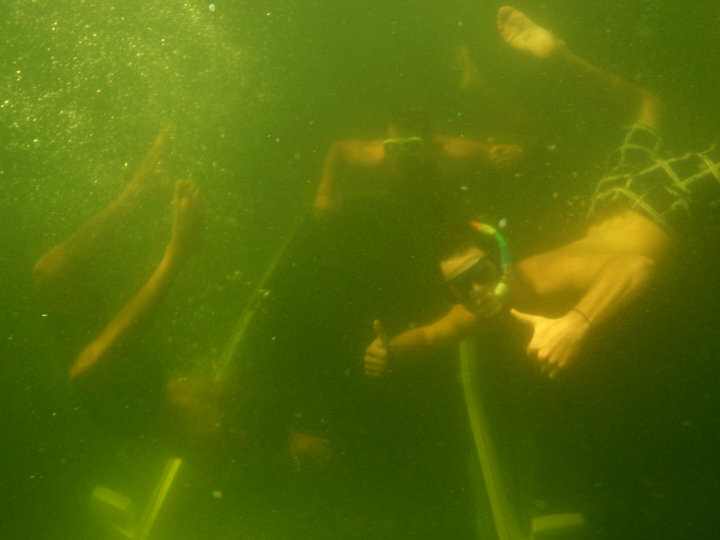 Some of the fall staff from Pathfinder went swimming and took some humourous pictures. Here is one, the rest are here. I have to say ... you'd think that would happen more often. It doesn't take much to forget the parking brake. I remember when I was a kid, my Dad forgot to engage the break on our 1959 Rambler American. It rolled over a 1/4 mile down a hill and was undamaged, and caused no harm. It did happen in the middle of nowhere. "The new artificial reef in Algonquin Park!" In seriousness - the damage to Source Lake makes me sad. Harv, do you need reading glasses? 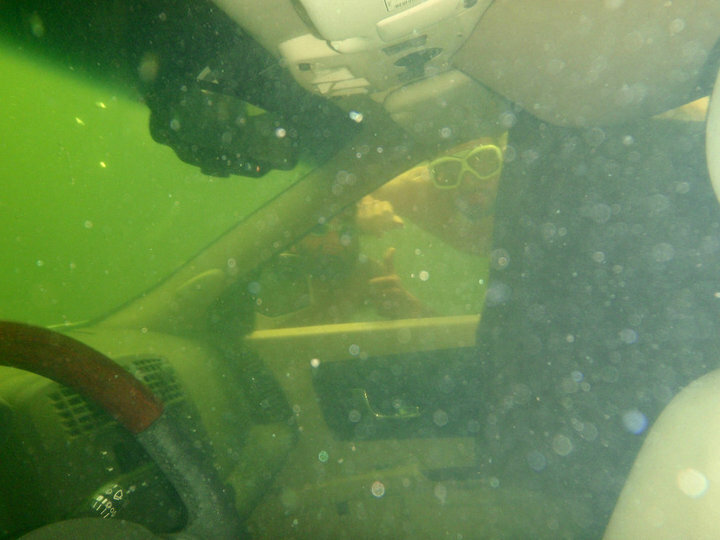 You an see the mirrors quite clearly in the lower edge of the photo and the windshield pillars under the swimmers. The roof of the car is black because it is one those snazzy glass roofs. The pictures on Facebook show the car much better. I've asked the Pathfinder boys to let me know if they get pics of the recovery, it may be getting pulled out today. A firefighter buddy of mine said that they will probably use divers to feed straps under the vehicle and inflate special airbags to lift it out of the loon-poop. Modern vehicles are pretty well sealed up and considering that the thing just drifted offshore and sank, there probably is little physical damage to the car. Hopefully, few fluids have leaked out. hahaha a Facebook comment is "You should press the OnStar button for assistance."